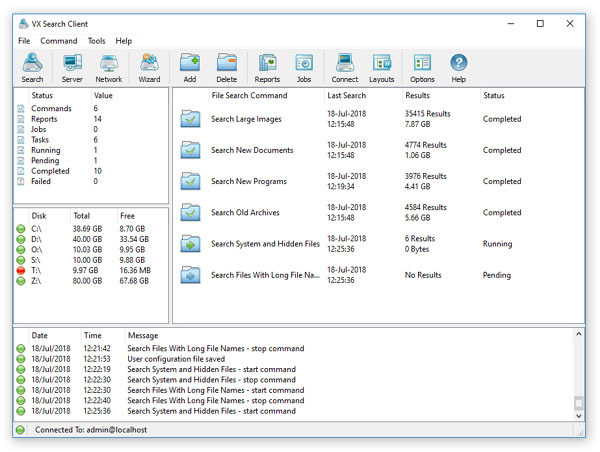 VX Search Server is a rule-based file search server, which runs in the background as a service and provides the ability to search files in one or more directories, disks, network shares or NAS storage devices by the file name, directory, regular expressions, file size, file type, file attributes, user name, creation, last modification or last access dates, text and binary patterns, JPEG EXIF tags, etc. VX Search Server allows one to setup an unlimited number of files search operations, with each one capable of searching files using an extensive set of file matching rules combined with logical operators. Power users are provided with the ability to combine multiple types of rules into hierarchical file search queries capable of precisely searching required types or groups of files. 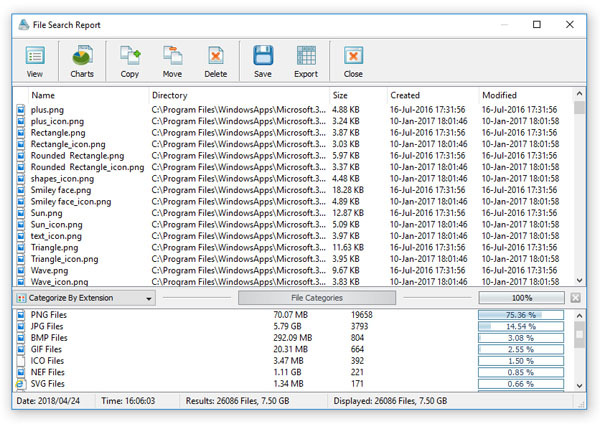 For example, VX Search Server allows one to search for all types of documents with the file size more than X MB that were modified during the last Y months. VX Search Server may be controlled using a full-scale client GUI application and a command line utility locally or via the network. The user is provided with the ability to review file search results, generate HTML, PDF, text, CSV, XML reports or export file search results from multiple servers to a centralized SQL database for future review and analysis. In addition, VX Search Server provides the ability to schedule periodic file search operations according to user-defined time intervals, automatically generate reports and/or send E-Mail notifications when a file search operation finds a user-specified number of file search results.